It’s been anything but a laid-back summer for Nikki and Rabbi Mike Friedman as they’ve launched their new organization, Mekimi. Mekimi, a word found in the Book of Psalms and translated as “raise me up,” is at the core of the couple’s goals to support the community. At its upcoming Aug. 2 (8 p.m.) WOMBS gathering and Aug. 6 (7:30 p.m.) stereo typology class and concert, the community is certain to be raised. WOMBS: Women Of Mind, Body and Spirit, is a monthly gathering led by Nikki Friedman and Beth Broodo, MS, LPC, RYT. A community of women giving, and getting, strength and support will explore Jewish texts that discuss infertility among the biblical personalities and their strength in the face of challenge. Through discussion and exercises related to the texts they’ll navigate the trials of infertility and miscarriage, with topics including emotional turmoil, financial implications, primary and secondary infertility and maintaining marital harmony and connection while trying to conceive. 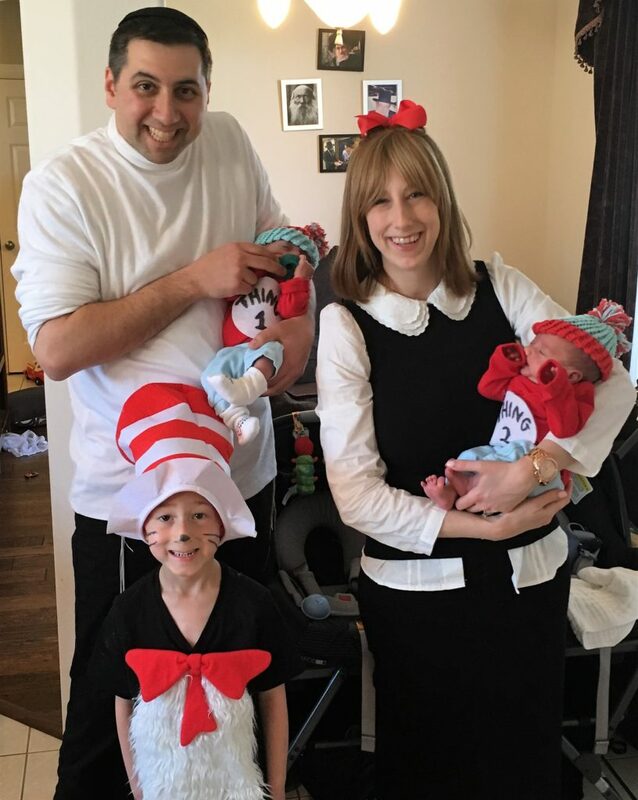 Last March, Rabbi Mike and Nikki Friedman, founders of Mekimi, celebrated Purim fun as the Cat in the Hat and friends with their children (left to right) Azarya, Shalev and Akiva. Stereo typology, scheduled on the Hebrew calendar’s 15th of Av, one of the holiest days of the year, will explore music from David’s Harp to David Cassidy and from Bach to Carlebach. Rabbi Friedman will lead a class and concert that explores the nature, role and impact of music. Mekimi’s schedule also includes Bagels No More: the challenges of healthful eating in Jewish culture; Unplugged: Serenity in a Digital Age — an ancient Jewish form of meditation and prayer; Just Paint: a women’s opportunity to connect by painting a common Jewish-themed piece; as well as workshops for parents of children with anxiety and depression, post-conversion support and more. “Mekimi integrates Jewish and holistic principles of emotional, physical, intellectual and spiritual wellness that provide tools to overcome everyday challenges and infuse joy and meaning into our participants’ lives,” said Rabbi Friedman. The organization has already held events. On June 4, Nikki shared the couple’s “Tale of Infertility” (which had a happy ending). There was an Unplugged series event about the benefits of using essential oils, and the July 23 Smart Eats program with Rabbi Yaakov Marks, who provided information about the Jewish approach to food as spiritual nourishment. All were well-received. Laurel Fisher, who says spirituality and meditation have always been a part of her Jewish experience, loved watching Rabbi Friedman connect with the young people as well as the adults. For Mark, who previously played basketball and talked about prayer with Rabbi Friedman, connecting spiritually through conventional prayers didn’t always work. The multi-talented Nikki, a Chicago native, attended a Conservative Jewish day school, a pluralistic Jewish summer camp and a public high school. She is an artist of paintings and hand-beaded stainless steel pieces and teaches math at Yavneh Academy. For Rabbi Friedman, a clinician at Jewish Family Service and seventh generation rabbi, the road to Dallas, via Washington, D.C. and then Jerusalem, has been based on the mission to spread Jewish teachings and spiritual principles that illuminate the human condition. “I love the part about being a rabbi that connects to people and I love the part of being a counselor that is helpful. Through Mekimi, I can join that love,” said the talented musician, a former congregational assistant rabbi. He is also the Dallas chapter coordinator of Yachad–The National Jewish Council for Disabilities and a Judaic studies teacher at Akiba and Yavneh academies. Educated at a nondenominational Jewish day school, with family members of all Jewish affiliations, Rabbi Friedman says being raised with diversity encouraged him to respect and love all Jews. For him, the connectedness of the Jewish people is stronger than the separation and he’s guided by the idea that labeling is disabling. “Dallas has made a wonderful home for us over the last seven years,” said Rabbi Friedman, whose family with Nikki includes sons Akiva, Azarya and Shalev. “We want to give back by reaching the intellect, body, and soul of those in our community,” he added. For the WOMBS meeting location, email wombs@mekimiwellness.org. For stereo typology location, or more about Mekimi, visit mekimiwellness.org, email info@mekimiwellness.org or call 972-896-0519.